Cervical arthrodesis is a surgical procedure that joins selected bones in the cervical spine. Surgical pathologies of the cervical spine have commonly been addressed through anterior and posterior approaches. The anterior approach to the cervical spine was developed in the 1950s by Robinson and Smith,  Bailey and Badgley,  and Cloward. However, the posterior approach to the cervical spine remained the preferred choice of many spinal surgeons until the 1980s, when Meyer reported on the management and treatment of traumatic cervical spine fractures through the anterior approach. For more information, see Approach Considerations. Lateral radiograph shows a two-level anterior cervical discectomy and fusion from C 4/5 through 6/7. An anterior plate with carbon fiber intervertebral spacers are used for fusion and internal fixation. 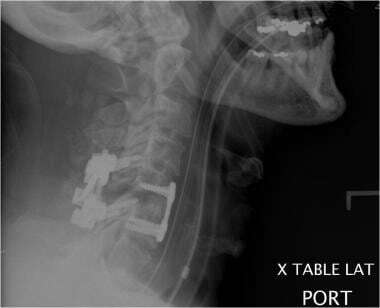 Postoperative lateral radiograph shows anterior and posterior fusion with instrumentation in a patient with an unstable cervical spine fracture. Complications related to the cervical lateral mass and rods technique include both neurological and vascular causes. Neurological injuries can result from direct trauma to the spinal cord and nerve roots. In addition, cerebrospinal fluid leak can occur, especially during the laminectomy portion of the procedure. To minimize these neurological risks, it is recommended to prepare the screw holes prior to the decompressive laminectomy. Iatrogenic injury to the vertebral arteries is rare but possible secondary to misplaced lateral mass screws. Complications related to the anterior cervical approach can be grouped into neurological, vascular, and visceral complications. These risks may be increased in revision surgeries. In addition, grafting and internal fixation also carry risks, including graft failure, pseudoarthrosis, and screw-plate fracture. The most common neurological complication after the anterior cervical approach is hoarseness and/or dysphagia that may result from injury to the recurrent laryngeal nerve. Vocal cord dysfunction is usually present when this nerve is compromised. Hoarseness and dysphagia are usually temporary, and full recovery is expected; however, if the problem persists for more than 3-6 months, swallow barium studies and/or direct laryngoscopy by an ear, nose, and throat specialist should be considered for possible treatment. Surgeries on the upper cervical spine levels at or above the C3 can be associated with an increased risk of injury to the superior laryngeal nerve. In addition, Horner syndrome can develop the sympathetic trunk is injured during the exposure portion of the procedure if dissection is carried laterally over the longus coli muscles. Finally, injury to the spinal cord is rare but possible. The main arterial systems in the neck are the carotid and vertebral arteries. While the carotid artery is more susceptible to injury during dissection, exposure and placement of the self-retaining retractors, the vertebral arteries are more susceptible to injury during the discectomy and neural foramen decompression. The surgeon should be prepared to deal with these injuries if they arise. Direct arterial repair is ideal but difficult with the vertebral arteries. Tamponade with Gelfoam may be sufficient, and arterial ligation should be considered as a last resort. An immediate postoperative angiogram is necessary if vascular injury is suspected, followed by the appropriate endovascular intervention depending on the pathology. The incidence of esophageal injury is low, and these injuries usually result from malpositioned self-retaining retractors. If perforation of the esophagus occurs, direct repair followed with antibiotic treatment should be considered. A high index of suspicion for this complication is recommended so that early intervention can be performed. Fever and dysphagia are usually early symptoms of esophageal perforation. Robinson RA, Smith GW. Anterolateral cervical disc removal and interbody fusion for cervical disc syndrome. Bull Johns Hopkins Hosp. 1955. 96:223-224. BAILEY RW, BADGLEY CE. Stabilization of the cervical spine by anterior fusion. J Bone Joint Surg Am. 1960 Jun. 42-A:565-94. [Medline]. CLOWARD RB. The anterior approach for removal of ruptured cervical disks. J Neurosurg. 1958 Nov. 15(6):602-17. [Medline]. Meyer PR. Cervical spine fractures: Changing management concepts. Bridwell KH, DeWald RL. Textbook of Spinal Surgery. Philadelphia: Lippincott-Raven; 1991. Harel R, Stylianou P, Knoller N. Cervical Spine Surgery: Approach-Related Complications. World Neurosurg. 2016 Oct. 94:1-5. [Medline]. Lee JC, Lee SH, Peters C, Riew KD. Adjacent Segment Pathology Requiring Reoperation Following Anterior Cervical Arthrodesis: The Influence of Smoking, Gender, and Number of Operated Levels. Spine (Phila Pa 1976). 2015 Feb 19. [Medline]. Shiban E, Nies M, Kogler J, Kogler L, da Cunha PR, Meyer B, et al. No correlation between radiological and clinical outcome 1 year following cervical arthrodesis. Acta Neurochir (Wien). 2018 Apr. 160 (4):845-853. [Medline]. Siemionow K, Tyrakowski M, Patel K, Neckrysh S. Comparison of perioperative complications following staged versus one-day anterior and posterior cervical decompression and fusion crossing the cervico-thoracic junction. Neurol Neurochir Pol. 2014. 48(6):403-9. [Medline]. White AA, Panjabi MM. Biomechanical considerations in the surgical management of the spine. White AA, Panjabi MM. Clinical Biomechanics of the Spine. Philadelphia: Lippincott-Raven; 1990. White AA, Panjabi MM. White AA, Panjabi MM. Clinical Biomechanics of the Spine. Philadelphia: Lippincott-Raven; 1978. Sharma V, Singh SK. Retrospective Analysis of Arthrodesis from Various Options after Anterior Cervical Discectomy. J Neurosci Rural Pract. 2018 Jan-Mar. 9 (1):14-18. [Medline]. [Full Text]. Caspar W. Anterior stabilization with the trapezial osteosynthetic plate technique in cervical spine injuries. Kehr P, Weidner A. Cervical Spine. New York: Springer-Verlag; 1987. Caspar W, Barbier DD, Klara PM. Anterior cervical fusion and Caspar plate stabilization for cervical trauma. Neurosurgery. 1989 Oct. 25(4):491-502. [Medline]. Suh PB, Kostuik JP, Esses SI. Anterior cervical plate fixation with the titanium hollow screw plate system. A preliminary report. Spine (Phila Pa 1976). 1990 Oct. 15(10):1079-81. [Medline]. Tippets RH, Apfelbaum RI. Anterior cervical fusion with the Caspar instrumentation system. Neurosurgery. 1988 Jun. 22(6 Pt 1):1008-13. [Medline]. Shapiro S. Banked fibula and the locking anterior cervical plate in anterior cervical fusions following cervical discectomy. J Neurosurg. 1996 Feb. 84(2):161-5. [Medline]. 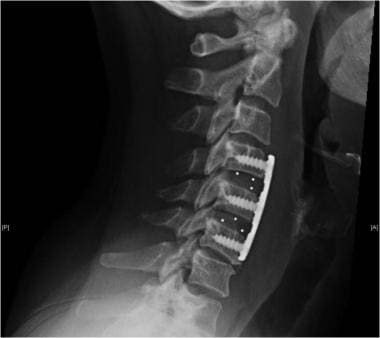 Aebi M, Zuber K, Marchesi D. Treatment of cervical spine injuries with anterior plating. Indications, techniques, and results. Spine (Phila Pa 1976). 1991 Mar. 16(3 Suppl):S38-45. [Medline]. Hadra BE. Wiring the vertebrae as a means of immobilization in fractures and Pott’s disease. Trans Am Orthop. 1891. 206.